Our courses range from basic offshore safety, through to advanced fire fighting and specialist industrial training. Providing the required skills for all persons currently working in or looking to commence any type of roped access work. Providing delegates with the knowledge and skills to begin the second stage of their training in the workplace under supervision. Ensuring that personnel have the understanding, knowledge and practical skills to fulfill the role of the Rigger safely and effectively. Providing training to personnel wishing to become competent in Rigger and Banksman Slinger roles within the oil & gas industries. OPITO accredited Banksman & Slinger training will enable you to undertake the role and preserve the safety of all crew members. This training is designed to provide delegates with a basic knowledge of the blaster/painter industry. A range of world-class training courses catered towards those whose role involves working at height or in confined spaces. Providing sufficient knowledge and skills to work competently and safely on a wind turbine. The Boat Transfer training allows the delegate to assess risks, learn about the PPE and procedures used for boat transfer and the principles of Sea Survival. Providing a Medical Examination which classifies them as medically fit to work in the offshore environment. Minimum Industry Safety Training. Designed for personnel working within the Oil and Gas Industry. Providing an awareness of the hazards on offshore installations, the offshore safety regime and safety management systems. Providing the necessary knowledge, understanding and skills to perform the role of the Emergency Response Team Leader effectively. Providing the necessary knowledge, understanding and skills to perform the role of the Emergency Response Team Member effectively. Offering delegates training to apply safe working practices, to reduce risks in confined space environments. Providing the necessary knowledge, understanding and skills to perform the role of the Offshore Emergency Heli-Deck Team Member effectively. The further programme is to allow OERTM delegates to practise and be assessed on live fire exercises which they would not be able to conduct in the workplace. Designed to give managers the skills to effectively manage health and safety in their workplace. This has been developed by AIS with the help of leading offshore organisations in order to provide a solution to the skills shortage in this industry. Providing First Aid Training which qualifies delegates to act as the First Aider in the workplace. CCNSG provides delegates with necessary site safety information for a safer working environment. Providing participants with basic safety training so that they can carry out their tasks in a safe and competent manner. Delegates will be able to identify and select the correct form of safety harness and lanyard, applicable to their role in the work place. Offering basic awareness training to all persons working directly or indirectly with electricity transmission and distribution. Designed for all employees in the workplace who may have to use any form of personal protective equipment to meet the current legislation. Providing delegates with a good understanding of the risks and practical issues involved with manual handling. 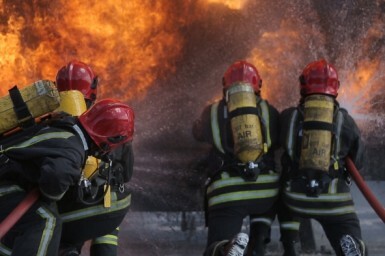 This course will provide a development opportunity for individuals who have been identified within their organisation to be suitable to deliver BA training to Fire Service personnel. This course provides those individuals who have already completed a breathing apparatus wearer's course the opportunity to refresh their skills and knowledge when deploying breathing apparatus as part of an emergency response team. This course will suit newly appointed Firefighters. The delegates will experience the practical and theoretical aspects of Breathing Apparatus. Candidates will experience the practical and theoretical application of Compartmental Fire Behaviour. The Fire Awareness Course is aimed at all staff (particularly new employees) in all workplaces, to help them identify and reduce the risks from fire in the workplace. This one-day course is aimed at members of staff who are identified in your emergency plan as having a supervisory role in the event of a fire. Our new state-of-the-art facility enables us to deliver a range of helicopter fire-fighting courses to new and existing customers. To provide those individuals who have just been appointed to their emergency teams the opportunity to wear breathing apparatus in hazardous conditions such as toxic atmospheres and dealing with large fires. To provide those individuals who form part of an emergency response team the opportunity to understand the principles of fires & firefighting.